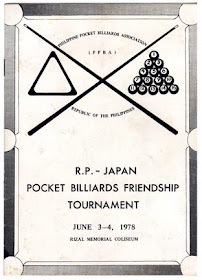 Here's the souvenir program of the 1978 RP-Japan Pocket Billiards Friendship Tournament held at the Rizal Memorial Coliseum, June 3-4, 1978. 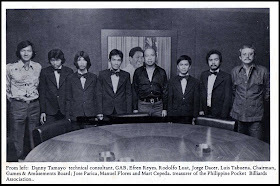 The Philippine team was composed then by Jose 'Amang' Parica, Efren 'Bata' Reyes, Rodolfo Luat, Jorge Dacer and Manuel Flores. That's the young Efren 'Bata' Reyes!! !